Joseph Williams is back! In Season Two Episode One we learned about his time in AmeriCorps, now we hear the rest of the story. 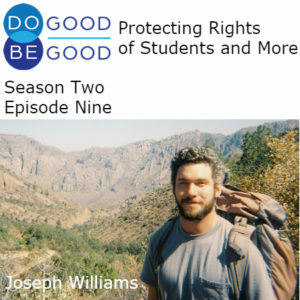 Joseph also worked at a wet shelter for people who are homeless in Flagstaff Arizona as well as working for the Southern Poverty Law Center in New Orleans on the school to prison pipeline issues. This is a shorter episode than usual, a bonus episode if you will! This season is sponsored by the Do Good, Be Good AmeriCorps Training Series. If you work for an AmeriCorps program or State Commission, contact Sharon to find out about customized training for your AmeriCorps supervisors or members.